Psychiatry has not always been open to the role of faith in the treatment of mental disorders. In fact, in some circles, religion is credited as the cause of certain mental conditions, particularly obsessive-compulsive disorder. It is sometimes suggested that religious doctrine and religious rules create the contexts in which anxiety and scrupulosity thrive. Ian Osborn, however, sees the relationship between OCD and faith a bit differently. In Can Christianity Cure Obsessive-Compulsive Disorder? Osborn invites readers to see the power, hope, and freedom that are available through faith in God. Osborn is a practicing psychiatrist and a professor. He specializes in the study of OCD, having written another book on the same subject (Tormenting Thoughts and Secret Rituals). He has been a professor in Psychiatry at Penn State University and University of New Mexico. His fascination and focus on OCD stems, in large part, from his own personal struggle with the disordered thinking – a story he recounts in the prologue. 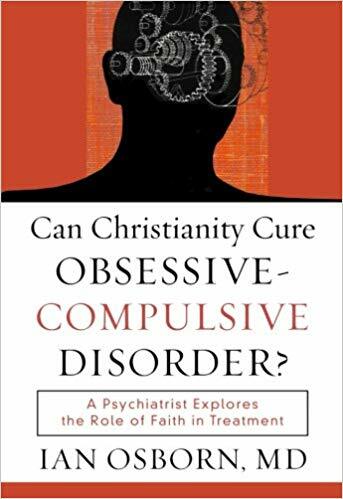 As both a professing Christian and a psychiatrist he believes that both medical science and personal faith are invaluable tools to help individuals overcome their OCD; but he did not come to that conclusions naively or quickly. His initial efforts to help himself by focusing on his faith resulting in shifting his obsession and merely overwhelming himself with religious-based anxiety. It was only after he put his faith on the shelf for a while and encountered clients who were crediting God with their recovery from OCD that he began to revisit the issue. This book is his effort to help readers see what he discovered: faith is a vital tool for overcoming intrusive thoughts. The book has four main ideas, as Osborn describes them. First, he intends readers to see the power of Christian faith in the stories of three theological giants: Martin Luther, John Bunyan, and Therese of Lisieux. Their stories comprise the bulk of the book, each taking up a whole chapter of their own. Each of their own personal accounts displays evidence of a sever case of OCD. Each has major symptoms of the disorder, and several even contemplate suicide. They struggled with their faith and yet, it was for each of them some version of the doctrine of justification by faith which set them free. This is particularly shocking considering Therese in particular remained a devout Catholic and later became a Church-honored Saint. The second major point of the book is that scientific research substantiates the claims of the role of faith in treatment. Here Osborn combines his worlds beautifully and demonstrates that psychiatry has nothing to fear in faith, but rather should take full advantage of it for the help of those who suffer. He shows some parallels between healthy spiritual counsel and Cognitive-Behavioral Therapy. He notes the inflated sense of responsibility that suffered of OCD tend to have, and notes that one of the key tools in therapy is the practice of transference of responsibility. Here, Osborn argues, faith has the most to offer counseling. Transference of responsibility does work, but usually only in the short-term because, after all, those who take up such responsibility are finite creatures. But to transfer responsibility to omnipotent, omnipresent, omniscient, and omnibenevolent God presents a great foundation for trust and peace. The third major point of the book seeks to draw a historical etiology for the rise of OCD in the West. Osborn makes a compelling argument that the rise of individualism birthed an increased sense of anxiety due to increased sense of personal autonomy and responsibility. Here we see the complex relationship between faith and OCD more clearly. For, in one sense it is true that faith may be a trigger to the rise of obsessive-compulsive disorder. As individualism became to dominate the philosophical landscape it impacted faith by suggesting that individuals were personally and almost entirely responsible for their eternal state. Individuals were responsible for weighing their sin and for addressing them in order to attain a more holy life. The Bible does, of course, command Christians to fight sin, grow, and strive towards holiness, but it also empowers them through the Holy Spirit to do such things. Sanctification is not a purely man-driven effort and the gospel is still the hope of all believers, even those struggling with specific and weighty sin. Individualism applied to spirituality started to stress personal moral responsibility to a degree that it had not been stressed in the church before, and the weight of it is a possible, even probable, of the rise of OCD in the west. The final major point of the book explores how obsessiveness in the lives of Luther, Bunyan, and Therese not only caused them great pain but was actually the means by which God drew them to deeper faith. Psychology speaks of benefit finding, that is seeing how disorders may actually be viewed from within a positive frame of light. Christianity too acknowledges that suffering leads to growth (Rom. 5:3-5). Here Osborn brings those worlds together by looking at these particular historical case studies to show that OCD may be a “catalyst for great accomplishments” (21). The book is wonderfully written and accessible. It’s content was both helpful to me as a professional and insightful to me as a Christian and lover history. I had never read Luther or Bunyan through the lens of psychiatry and found great value in doing so. There are moments where I might disagree with a few things that Osborn says about the disorder or about treatment, but overall I found this book incredibly helpful. Counseling those suffering from OCD is one of the most complicated types of counseling situations. This book gave me a lot of help and insight and I will be referencing it for years to come.